Formula retail is part of the Inner Sunset streetscape, with Jamba Juice, Starbucks and Posh Bagel all operating for years at the intersection of 9th & Judah. Recently, a new Quickly tea location opened without going through the proper permitting process and is now closed by city order, an example of what happens when business owners run afoul of formula retail regulations . While researching how San Francisco’s laws for chain stores came to be, we discovered that a contentious fast food restaurant on 9th Avenue was one catalyst for the switch to tighter rules for chain retailers. Read on for the backstory on how it all went down. In November 1996, Eddie Szeto successfully obtained a building permit to open a new Burger King at 1325 9th Ave. Because the space was less than 1,000 square feet, no Planning Commission hearing was required, but neighborhood opposition coalesced quickly. 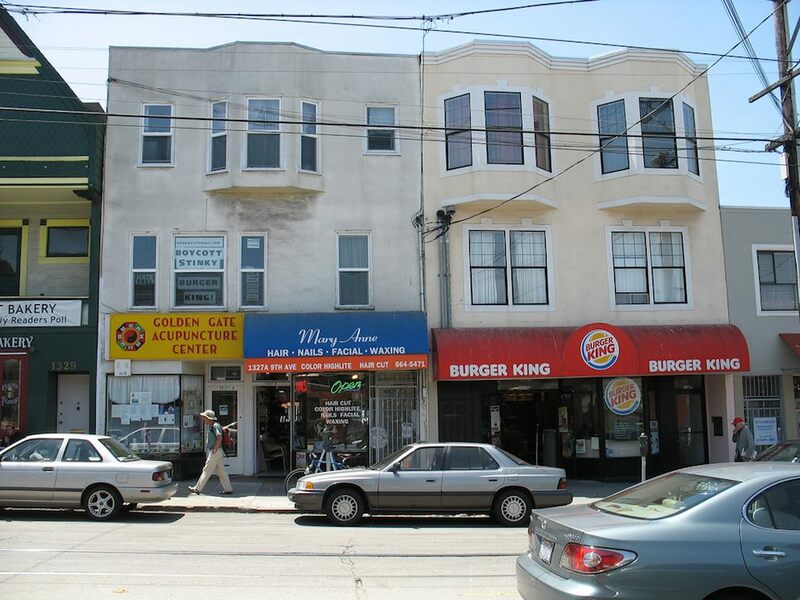 “First, we had to deal with Blockbuster; now, it’s Burger King,” the Inner Sunset Merchants Association‘s then-president Rolf Mueller told the Chronicle. “We will fight them to the core.” Residents had successfully blocked Blockbuster from opening a mega store at 9th & Irving in 1995. Even though Szeto received permission from the Board of Permit Appeals to proceed with the Burger King, the Board of Supervisors’ Housing and Land Use Committee decided to take up the issue the following month. After almost two hours of testimony, the body decided that it lacked jurisdiction to intervene. After the Burger King opened for business, tensions persisted between the restaurant and its detractors. A neighbor in an adjoining apartment even posted protest signs in his windows (pictured above). After a series of escalating confrontations, Szeto obtained a restraining order against a man who claimed he could no longer open his windows because of the restaurant’s ventilation. In February 1997, the Chronicle reported that vandals splattered paint on windows and hurled glass bottles into the store. After anti-Chinese flyers were found nearby, former Supervisor Leland Yee called for an investigative hearing and a hate-crime investigation. Szeto’s was the first of several Asian-owned businesses to be targeted that year, prompting town meetings and volunteer efforts to remove swastikas and replace broken windows. That spring, the Board of Supervisor’s Housing and Neighborhood Services committee approved an 18-month moratorium on new liquor licenses in the Inner Sunset. Shortly thereafter, legislation was passed to create an Inner Sunset Neighborhood Commercial District that required neighborhood notification of any changes in use to retail spaces. In the case of Burger King, opponents said they weren’t able to find any project permits on file. As part of his platform in the 2003 mayoral race, then-Supervisor Matt Gonzalez proposed citywide legislation for formula retailers. Gonzalez, a late entrant in the race, had already called for new rules to cover coffee shops and pharmacies. When other candidates endorsed ideas for giving residents a louder voice in the permitting process, Gonzalez expanded his plan to cover more businesses. Under the rules he proposed, chain stores would be required to send neighbors written notifications with details about their plans. Residents could then ask Planning to review proposals or hold a public hearing before the body voted a project up or down. Upon taking office in January 2004, Mayor-elect Gavin Newsom announced a new probe of the Department of Building Inspection, the city agency that grants permits. The agency had been the target of multiple FBI corruption investigations regarding allegations of favoritism. The following year, DBI official Gus Fallay was charged with bribery and perjury, but charges were dropped in 2007 when a deadlocked jury failed to convict. On March 23rd, 2004, the Board of Supervisors approved new restrictions on chain stores, which were then defined as companies that had more than 11 locations nationally and two or more characteristics, such as employee uniforms, signage, color schemes, facades, trademarked merchandise and decor. The law was later amended to cover all businesses with 11 or more global locations, which is the regulation in effect today. After 10 years, Szeto closed the Inner Sunset Burger King in 2007. “I had other business interests, and the lease was coming up,” he told us. Today, the former burger joint is home to Nabe Restaurant. “San Francisco is an interesting place to do business,” said Szeto. The 4-bedroom, 2,900 square foot Victorian mansion at 1022 Stanyan Street is getting a remodel, so we took a look into its history. The story turns out to include pre-Gold Rush settlers, the development of the Financial District, a prominent local family, and charges of treachery against the government. Emanuel Charles Christian Russ was a German immigrant who came to prominence after building the city’s first hotel and thirty shacks at the corner of Pine and Montgomery using wooden bunks he purchased from a ship moored in the bay. Nine months after his family’s arrival, gold was discovered in the Sierras. Several of his sons left to seek their fortune, but the elder Russ “remained in the city, knowing there were harvests to be reaped at home, in city real estate,” according to Tales of San Francisco. After an 1852 fire reduced the Russ House and surrounding shacks to cinders, Russ built the American Hotel on the same location, as well as a family mansion at Sixth and Harrison, south of Market. 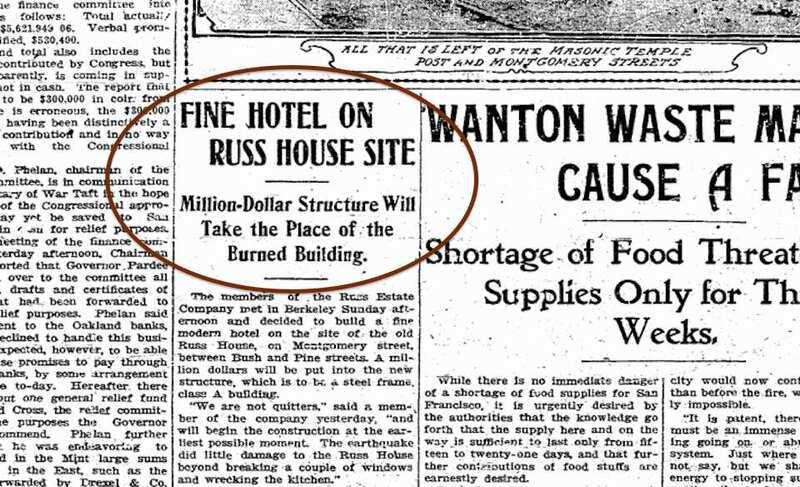 He quickly became one of the city’s largest landowners and established the Russ Estate Co. Today, the Russ Building stands on the site of the old hotel; built in 1927, the 31-story building claimed to be the tallest edifice west of Chicago for 30 years. 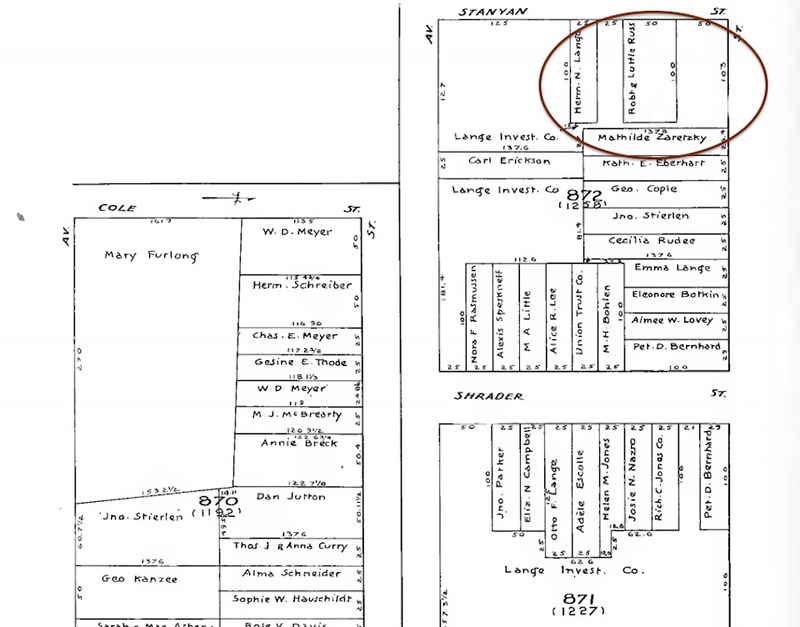 According to a 1907 Block Book, the land under 1022 Stanyan was owned by Emanuel’s grandson, Robert R. Russ, a notary and secretary of Russ Estate Co. That year, he and his wife Lottie moved from 3111 24th Street to their new home on Stanyan. 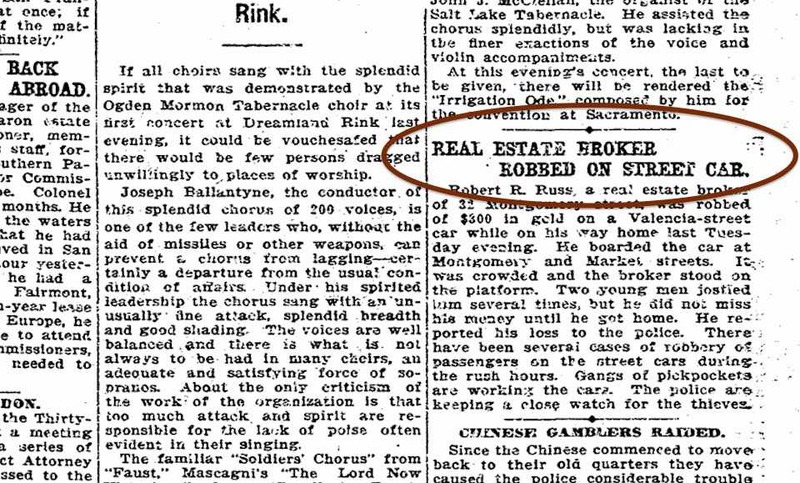 To get to his office at 32 Montgomery, Russ used one of the new streetcar lines that reached Stanyan, but a September 1907 article reported that a gang of pickpockets relieved him of $300 in gold while he rode home on a crowded car. It’s unknown whether the experience put Russ off public transit forever, but in 1909, his wife Lottie posed behind the wheel of their new 1910 Packard Model L for a Chronicle article. According to newspaper accounts, Russ had a sincere need for speed – he was a member of the Bay City Wheelmen cycling club, as well as several automotive societies. As a descendent one of the city’s wealthiest families, Russ’ doings were frequently reported upon: a successful hunting trip with friends to Humboldt County, gala events for private clubs and socialite weddings gave reporters plenty of reasons to spill ink, but in 1919, the Russ name stopped appearing on the Society page and became hard news. After World War I ended in November 1918, the US government prosecuted a number of cases involving the conduct of allegedly disloyal Americans, generally for providing aid and comfort to the enemy. On June 18, 1919, Russ turned himself into US Marshals before being indicted “on charges of violating the ‘trading-with-the-enemy’ act,” reported the Chronicle. According to the government, Russ and others used a Swedish intermediary to transmit funds to heirs of his father’s estate back in Germany. On July 9, Russ entered a plea of not guilty, along with co-defendants C.O. Swanberg, president of the Portola Cafe Company, and Henry W, Westphal, president of the Merchant’s Ice and Cold Storage Co. The trial generated several linear feet of headlines; at one point, Russ’ attorney accused the prosecutor of offering his client immunity if he turned state’s witness against his friends. The prosecutor “vehemently denied that he had made such a statement,” the Chronicle reported. 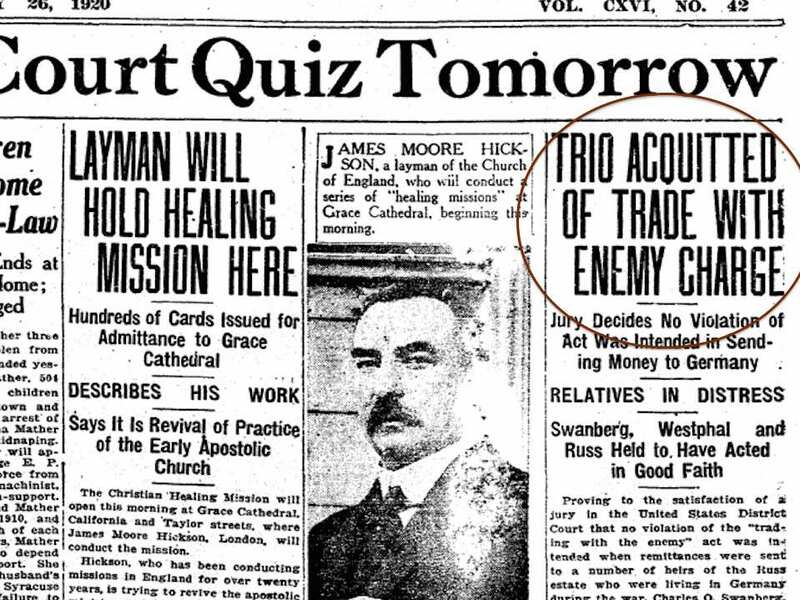 On February 25, 1920, Russ, Swanberg and Westphal were acquitted of all charges, with the judge ruling that the men acted in good faith to help “suffering relatives who were caught in Germany at the outbreak of the war.” The Chronicle reports the defense entered letters into evidence from Westphal’s German relatives that described “grave danger from starvation” and other bleak conditions facing Russ’s relatives in the old country. The trial didn’t appear to negatively impact Russ’ business or reputation; advertisements and legal notices indicate that he carried on his work at Russ Estate Co. during his trial. After his acquittal, news accounts show that he was active in local cycling and automotive circles, and even wrote the Chronicle to complain about the outcome of a heavyweight boxing match. 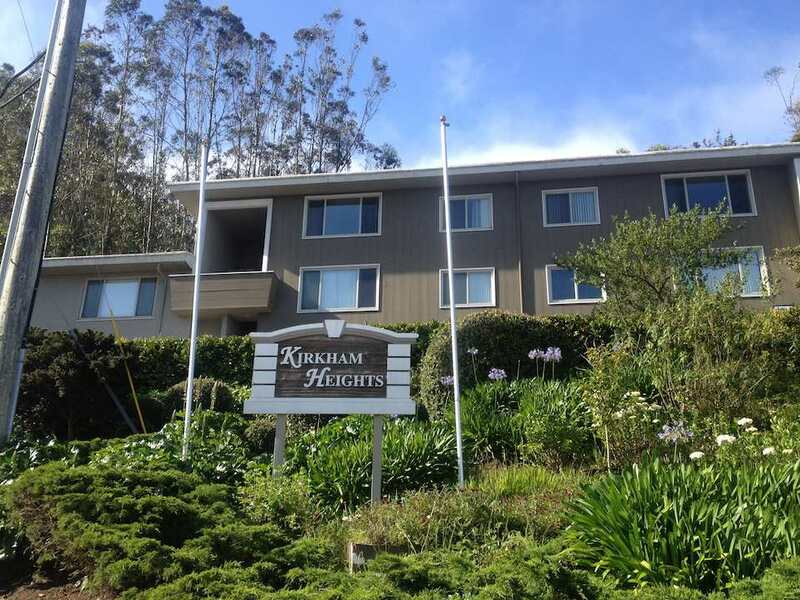 On Thursday, the San Francisco Planning and Urban Research (SPUR) nonprofit organized a tour of Kirkham Heights, an 86-unit apartment complex in the Inner Sunset that was built in 1950. The plan has been generating intense local debate after it was announced last fall and as outreach rolled out over the winter. We decided to tag along to hear about the latest, and to see if we could talk to nearby residents. Here’s what we came away with. 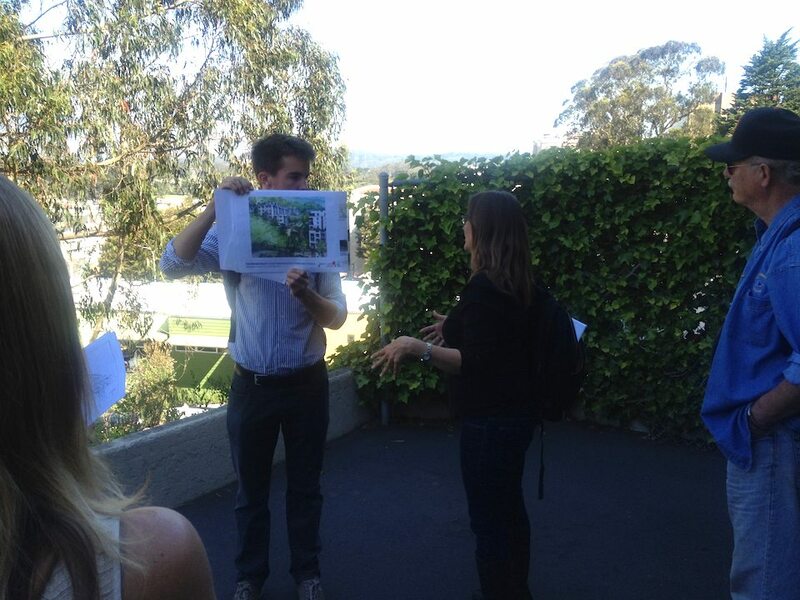 Representatives of site owner Westlake Urban walked attendees through the 6.35-acre property to visualize proposals for transforming it into a 460-unit development without significantly increasing its footprint. The tour was co-presented by the San Francisco Housing Action Coalition. Kirkham Heights “was built for people who drove up to their homes and drove out,” said Naomi Porat, co-founder of project development management firm Transform Urban. “Now, we’re reorienting it toward community.” The project is still in its early stages; pending environmental reviews and city approval, construction is at least two years away. 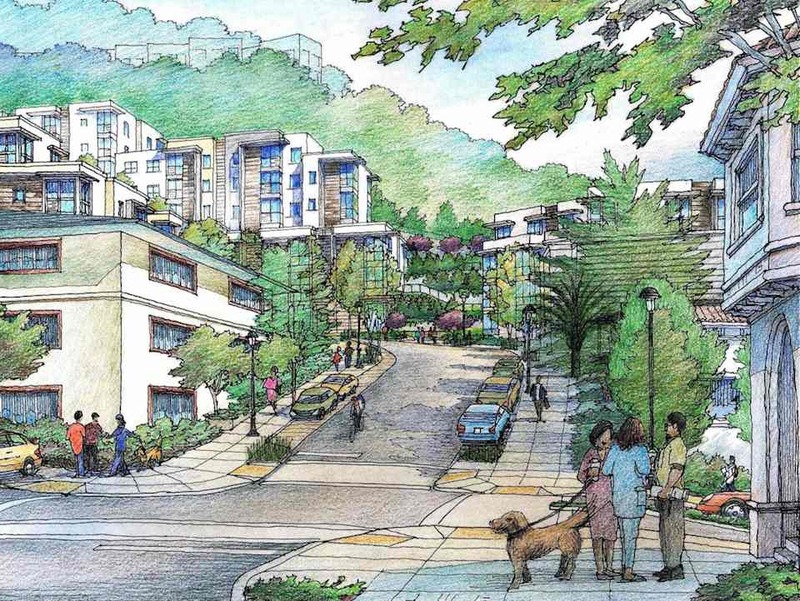 Today, the development is built into a steep hillside that abuts the west slope of the Mt. Sutro Open Space Preserve. Participants who walked or biked up the hill for Thursday’s tour showed clear signs of exertion; plans call for the hill to be substantially graded to promote walkability and make it ADA-compliant. During the tour, Gaye Quinn of Westlake Urban shared an anecdote about a resident who’d once broken her leg and and had to scoot up stairs backwards. “We’re transforming a site that is not wheelchair-accessible, where people cannot age in place, to a site that will be completely wheelchair-accessible,” said Porat. Carports are a major architectural feature at Kirkham Heights, but the new site will have .5 parking spaces per unit. “It’s not just about having less parking, but all of the programmatic elements that are part of being able to make less parking work,” said Porat. The developer plans to add secure bike storage along with bike- and car-sharing services. “What I’ve talked about are transportation management programs that include delivery services, farm-to table-services and all the things that would be needed to minimize needing a car,” said Porat. Porat said the redeveloped site will “have balconies and also rooftop space,” but that most of the open space would be communal. “There’s stoops that come right out into the street similar to how these Edwardians in the Inner Sunset are designed.” Streetscaping inside the reimagined complex would complement the work that UCSF is doing on nearby Parnassus Ave., she added. Visualizing the changes during the tour. Photo by Walter Thompson. Post-renovation, residents could drive in or enter the complex via private elevators or a ridgeline stairway with public art installations like the Hidden Garden Steps. Disabled residents will be “able to go up to the forest in a wheelchair through the elevator system,” said Porat. Current Kirkham Heights residents will have the option of a renting a new unit at the same rate for the apartment they have now, said Porat. “We’re looking at phasing the development so people could potentially stay on site,” she said. “We’re also looking at relocating them temporarily and bringing them back.” Transitional housing has yet to be identified, but “hopefully, we could find something close by in the neighborhood,” said Porat. In keeping with city mandates, 12% of the new units “need to be affordable at 55% of AMI (Area Median Income), so we’re doing that for the net new units,” Porat said, noting that “having a mixed community in terms of income, age and all other dimensions” is a project goal. According to the Mayor’s Office of Housing, 55% of San Francisco’s AMI is $39,250 for a 1-person household and $44,850 for two people.